Information architecture can be a daunting subject for designers who’ve never tried it before. Also, creating successful infographics and visualizations takes skill and practice, along with some advance planning. But anyone with graphic design skills can learn to create infographics that are effective and get data across in a user-friendly manner. Below are a collection of resources to get you going down the information architecture and data visualization path. Whether you just want to become more familiar with infographics and data visualizations for occasional use or are thinking of making it a career, the resources below will surely come in handy. There are also some beautiful examples and more roundups to see even more fantastic graphics. Information architecture can be so complex, it’s no wonder there are entire sites dedicated to it. 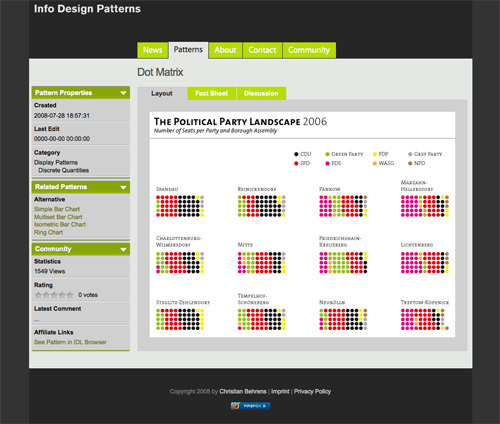 The sites below range from sites of individual information architects who share resources with their colleagues, to professional organizations, to design sites that include extensive information architecture resources. What’s Wrong with this Chart? UXBooth is a community blog about usability, user experience and information architecture. The “Information Architecture” section currently contains only three articles, but the quality of each article is always top notch. The articles and resources listed below appear on sites that don’t focus solely on information architecture. They’re as useful as the resources above, but focus on individual aspects of information design. Some excellent beginners guides and tutorials are also included here. The Organic Information Design PDF is from Ben Fry, and served as his Master’s Thesis at the MIT Media Lab. It introduces a new type of interactive information design using large quanities of data from dynamic sources. This article from Digital Web Magazine offers up a new approach to web development using information design techniques. 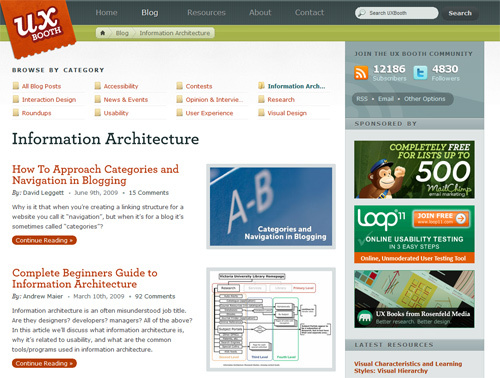 It’s a great resource for both information architects and web developers. This post from instantShift is one of the more comprehensive beginner’s guides to information architecture. It includes advice on how to design around a given set of data and offers some amazing examples of successful information design. This is a complete tutorial series from Webmonky on how to create successful information graphics. There are five parts, each addressing a different aspect of information architecture in depth. This is another comprehensive article geared toward those just starting out with information architecture and infographics. It includes some background information, links to notable information architects, resources, and links to common tools used in creating infographics. Below are some beautiful examples of infographics to get your creative juices flowing. They cover everything from pop culture (The Best Beer in America, Kill Bill) to political issues (Presidential First 100 Days in Office) to global environmental issues (No More Fish in the Sea, The Great Pacific Garbage Patch). Below are a few more roundups of information graphics and data visualizations. They include tons of great examples to inspire you and give you ideas. A great roundup from Abduzeedo of some fantastic infographics and other visualizations. A roundup of amazing infographics showcasing everything from types of coffee to global warming. An excellent roundup of infographics related to the financial crisis. Great ! I’ve already bookmarked the page. Visualizing data makes it more palatable. Thank you, very useful and while our IA, Design and Front-End talent are well versed – I’ve recommended this to account, biz-dev, media and analytics staff as well. I liked all links. Very useful. Well done. Illustrates exactly why data visualization proves “smarter” than spreadsheets alone! Great resources and examples! A few sites there that I haven’t heard of before. thanks for this wonderful post. excellent resources and examples…. Wow! I like Infographs and the links are great. Thank You very much. The full post as well as many more can be viewed by dropping bythis page? Look! it’s a magnificent building and house layout from Design (Cayman) Ltd. I’m fond of architectural layout like this, it seems really fascinating! You must completely fully grasp what the architectural design is. And it appears Architect designing these patterns are accredited professionals, I do not know what exactly is the expense, lol! Nevertheless, I want to have initiatives on the best way to create basic designs. I am aspiring to become a vivid architectural designer. In short, architects need to be a lot more than just plain architects. which is now available. It contains an easy to read chapter (10) on Data Mining. Among others, I received a wonderful compliment from Stephen Hawking who also recommended this “valuable book” to his students. Thank you for sharing this important information. It is very helpful for me.